Truro City assistant manager Wayne Carlisle has praised the efforts of his side's defence in their 3-0 victory over Havant & Waterlooville. Since losing 6-0 to Oxford City, Steve Tully's side have let in just two goals in five National League South games. 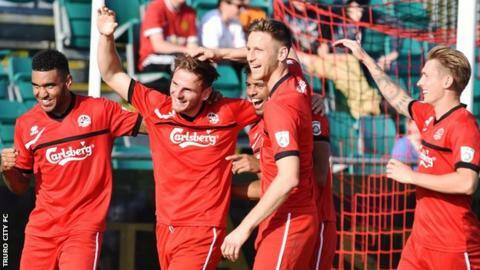 "They did their jobs fantastically well," Carlisle told BBC Cornwall. "We've worked on being solid in training when we haven't got the ball and even when we have, so it's good to see that transfer into performances." Carlisle continued: "Martin Rice in goal particularly stood out with his communication and organising the defence, and Aaron Pugh and Jamie Richards marshalled their centre forward really well." The White Tigers are unbeaten in their last seven games, keeping four clean sheets in that period. There was also a goalscoring debut for Truro's on-loan forward Jamie Reid. "Jamie did really well," added Carlisle. "Both Steve and myself know him and he showed that quality that we're trying to get that to the club."